Central Utah Water Conservancy District » For our kids’ sake! On a recent road trip with a group of young homeschoolers—they were headed for a tour of the Jordanelle hydropower plant—we were struck by the brilliant minds surrounding us. A casual discussion turned into a brainstorming session. The teens tossed out solutions to many of the water issues we’re facing in Utah today. It got us thinking about the great hands that will one day hold our future and about ways to further nurture their interest in and commitment to preserving our resources. While the weather is still family friendly, have your youngsters put their electronics aside for an afternoon and head into the wild. Take a hike. 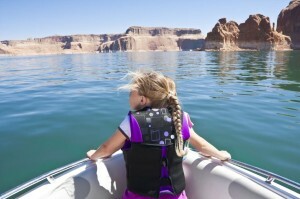 Gather up some fishing poles and head for the Jordanelle reservoir. Enjoy the natural wonders we have in abundance right under our noses. Not only will it teach them important life lessons such as patience—think about how long it takes for fish to bite sometimes!—but also it could promote a sense of stewardship. They will personally experience what’s at stake. Come see what we’re doing here at the Central Utah Water Conservancy District. Check into touring our plants. Visit the reservoirs. Head out to the Loveland Living Planet Aquarium, which through its various programs will soon offer interactive ways to put environmental situations in your little ones’ control. It can only build an appreciation of the water that comes out every time they turn on the faucet. At home, at work and at play, model behaviors that show them the importance of conservation and, with a little luck, trigger ideas about how to do it even better. If our young guests are any indication, they are a wealth of knowledge we definitely will need to draw on down the road. Any investment you make today can only strengthen their role in securing and preserving Utah’s future resources.